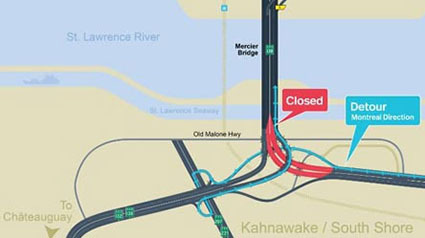 The Mohawk Council of Kahnawà:ke (MCK) has been informed by the Jacques Cartier and Champlain Bridges Incorporated that both of the Route 132 up and down ramps of the Mercier Bridge will be closed from Sunday, October 23rd at 3am to Monday, October 24 at 5am, and then again Monday, October 24 at 9pm to Tuesday, October 25 at 5am. 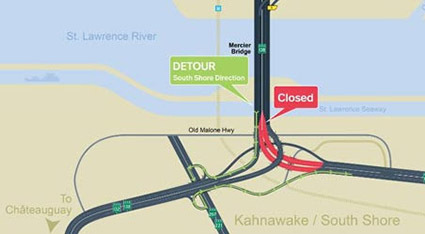 In addition, the Ministère des Transport du Quebec will close the left lane of the Kahnawà:ke-bound bridge for maintenance work on the guardrails. This closure is scheduled for Sunday, October 23 at 3am to Monday, to October 24 at 5am. * Please note, this closure may be postponed or rescheduled due to bad weather. The no trucks signs along the 138 west in Lasalle and on the Kahnawà:ke/southbound Mercier Bridge will be removed tonight at 10pm and should be completed by 3am. The 20 west access ramp from the 138 east in the Ville St. Pierre Interchange will be closed tonight at 11:59pm until Monday at 5am. • Closure of the 132 access ramp from La Prairie towards Montreal (see map below for detour route). Closure of the 132 access ramp from Montreal towards La Prairie (see map below for detour route).